Bedugul is Bali’s highland retreat, tucked into the crater of a volcano (1400 meters). Lush pine forests seem to create freshness in the air. Bedugul is known for the quality of its fruit, vegetables and flowers. The beautifully scenic lake Bratan, with its harmonious mountain panorama, provides everything from recreation to water for the springs, rivers and rice fields below. Boats, water skiing and parasailing are among the many water sports available in this area. Pura Ulun Danu Bratan, the temple that seems to rise out of the lake, presents itself beautifully. Also visit the botanical garden (Kebun Raya). This little island off Bali’s west coast is known for its beautiful coral reefs found nearby and the wealth of tropical fish inhabiting the waters around it. Menjangan is an excellent diving spot that has not been spoilt by tourism, possibly because it is quite far from the airport. The island itself is also worth a visit because of the beautiful sceneries it offers. Day trips by boat and rental of diving equipment can be arranged at nearby Labuan Lalang. Start the beach walk of your life just south of Tanah Lot. Pantai Seseh is a quiet beach of black volcanic sand that is mainly visited by local fishermen. Quiet, rough, and close to nature, this is beach is simply unforgettable. This little town offers is close to three superb places to visit. Pura Tirta Empul is a holy temple with bathing pools fed by the Pakerisan river. In the center of Tampaksiring is a little road that leads to Gunung Kawi, the ‘valley of the kings’, perhaps the most memorable place to see on Bali. Just north of Tampaksiring is a palace built by former president Sukarno in the 1950s. The water palace at Tirtagangga, about 6 km northwest of Amlapura, was built in 1948 by the last king of Karangasem, in a series of formal pools fed by a sacred spring. 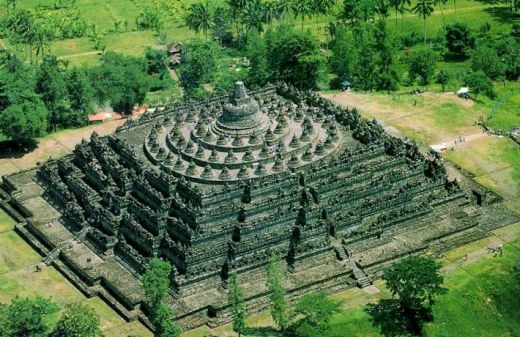 The eruption of Mount Agung in 1963 badly damaged the palace. It has gradually been restored, and is open to the public for a small fee. The main attraction is the swimming, which is permitted in several designated pools: a large one open to anyone, and a smaller one closer to the spring, for which an additional fee is charged. The water is indescribably refreshing, a swimming pool of holy water.